I’ve been home for more than a month, but I’m still sorting through the photos from my last vacation. I hope you won’t mind an occasional trip back to Europe as I get caught up. 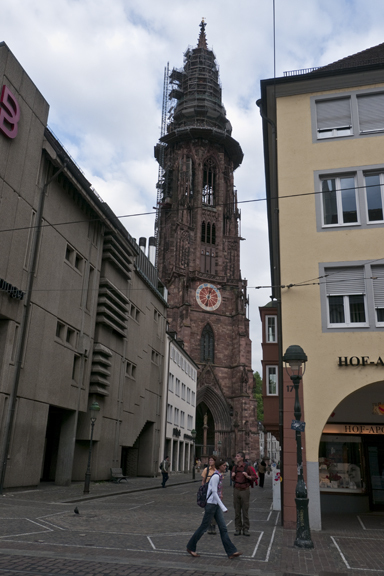 Today’s post is about the Münster in Freiburg, Germany. 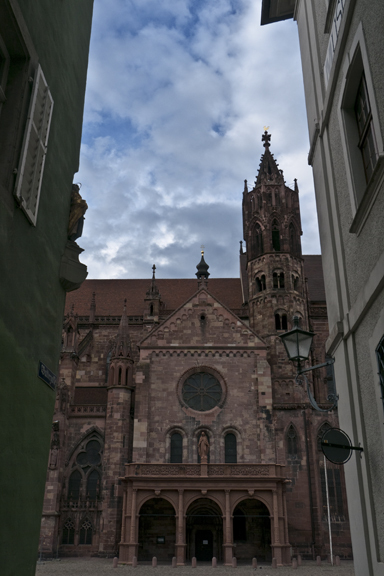 Whenever I visit a new city — particularly a European city — one of my first stops is usually a church. 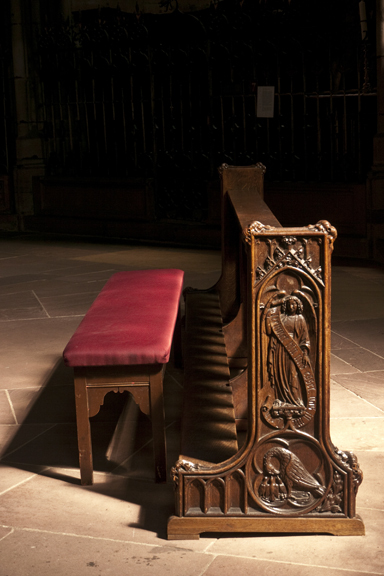 Churches are like time capsules, in a way: They reflect the values and sensibilities of the communities that built them. They’re also often full of art. Sometimes they house tombs. 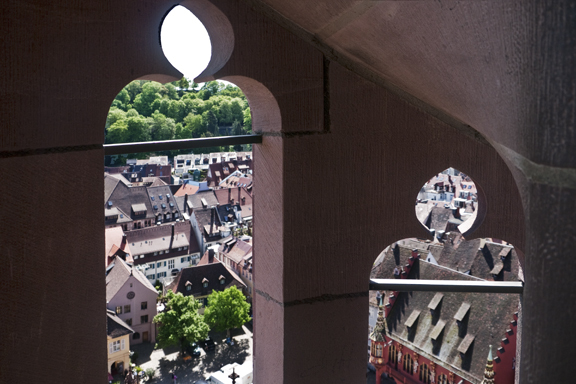 Many have bell towers that offer a bird’s-eye view. 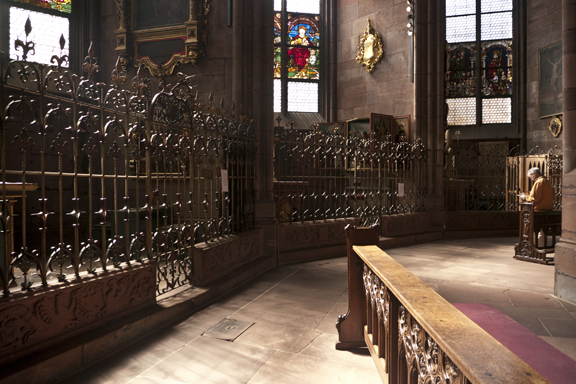 And almost always, churches are a quiet refuge from the sun and noise and crowds. 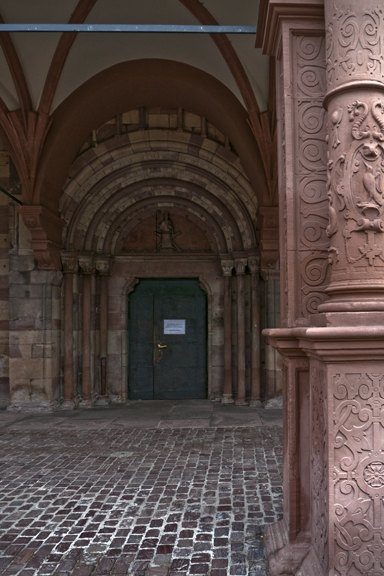 So I was a bit surprised (and dismayed) to have spent four days in Freiburg last November without having once stepped into the Freiburg Münster. 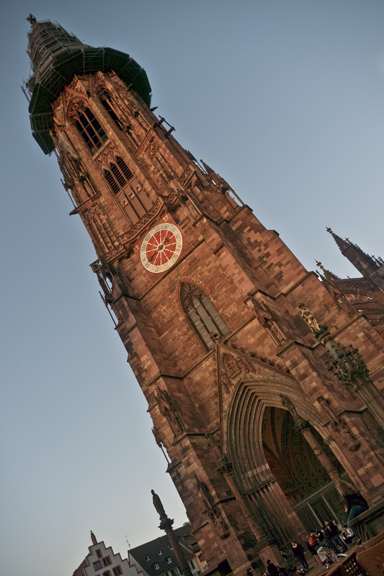 The Freiburg Münster was begun in the mid-1200s and completed in 1330. 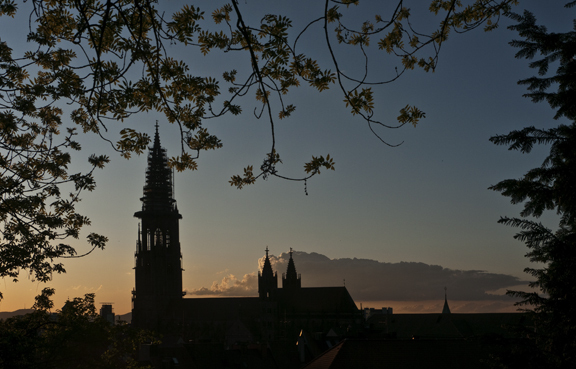 In 1827, it became the seat of the Archbishop of Freiburg and was thus declared a cathedral. 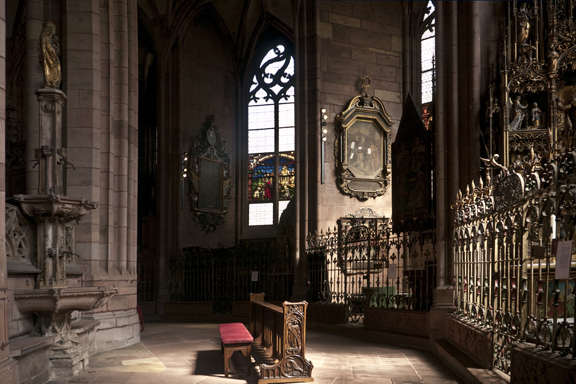 But here’s the fact that most interested me: It’s the only Gothic church in Germany whose tower has survived since the Middle Ages. 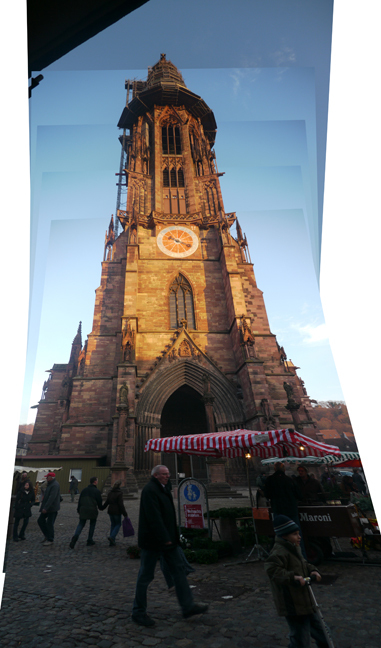 According to Wikipedia, “The Swiss historian Jacob Burckhardt once said that the church’s 116-meter tower will forever remain the most beautiful spire on earth.” Pity that I didn’t actually see it, because it was shrouded in scaffolding for renovation. 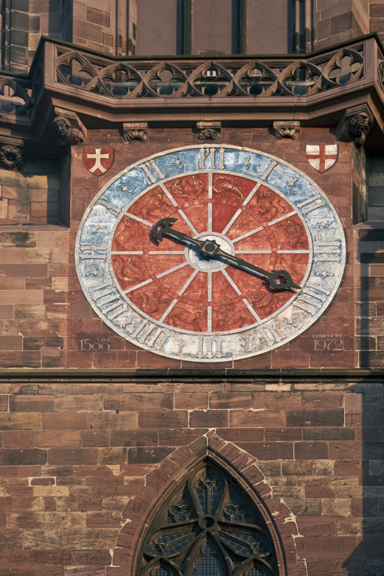 It’s a small miracle that the church still exists, actually — let alone the tower. 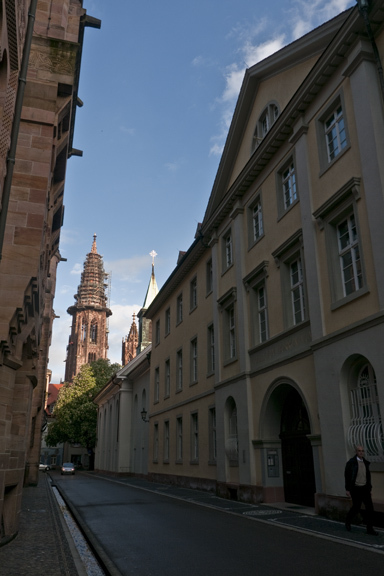 Freiburg was heavily bombed during World War II and many of the buildings around the Münster were leveled. 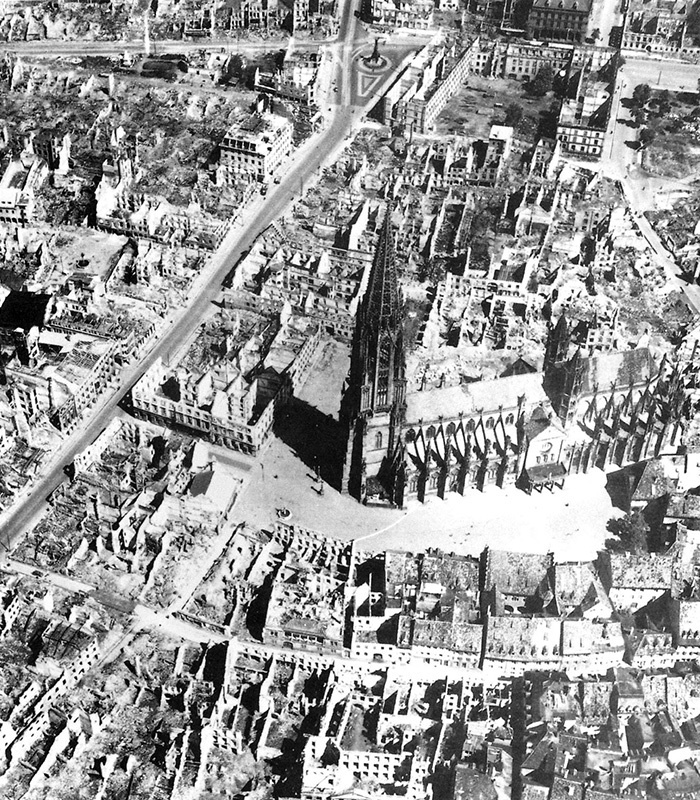 But the city was rebuilt on the original plan, and the buildings today have much the same footprint as those in the 1944 photograph above. The effect is extraordinary: If you didn’t know otherwise, you’d swear that this area is ancient. 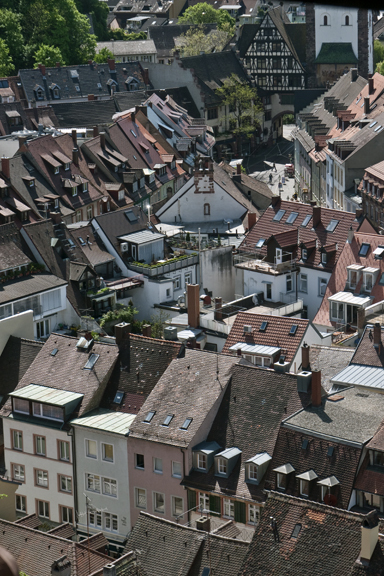 Rebuilding on the medieval street plan preserved Freiburg’s historic charm, of course. 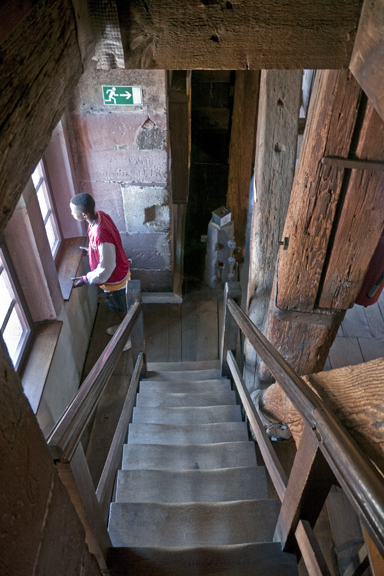 But it also made for some pretty tight quarters around the cathedral. This mightily vexed my inner photographer, because there was no way to get a decent shot of the entire exterior. 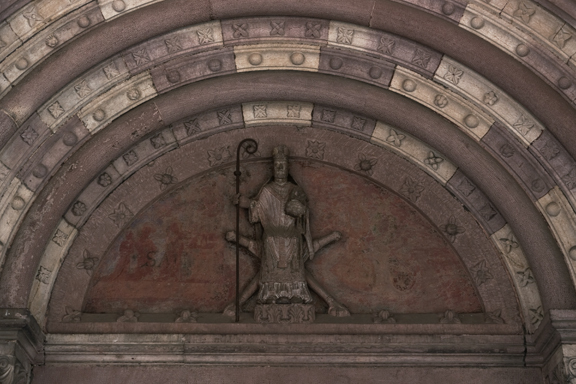 But I soon gave up on my quest to shoot The Whole Thing and focused on the Münster’s architectural details instead. Eventually I even ventured inside. 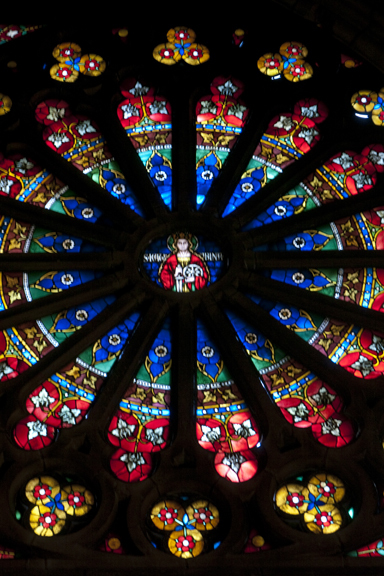 The interior was surprisingly bright, thanks to the gorgeous stained-glass windows — some of which date from the 1500s. 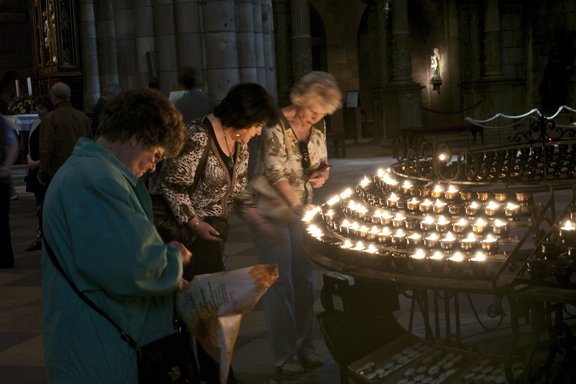 Thank God someone had the foresight to remove and protect them before Freiburg was bombed. 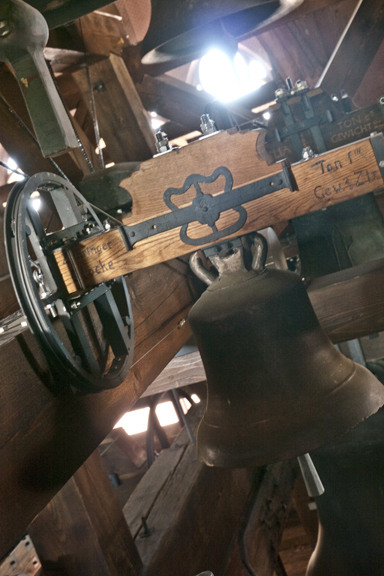 It was a beautiful clear day, so I decided to climb the bell tower. I found it unnerving that traffic was moving in both directions on these narrow, wedge-shaped stone steps. 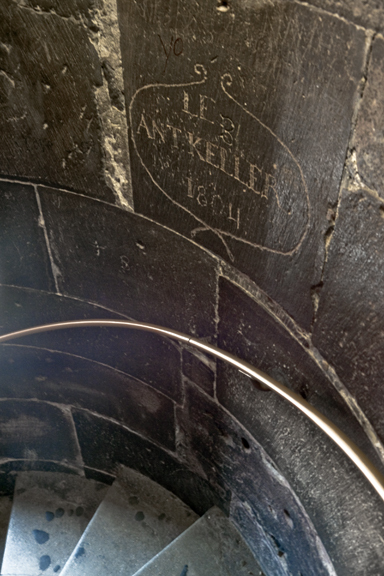 But at least the graffiti was entertaining. The climb was tiring, but the view from the top was well worth it. 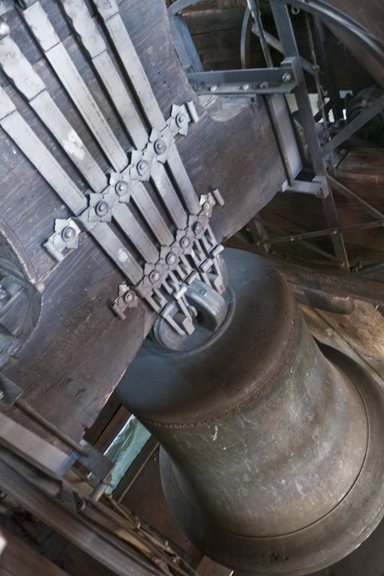 After reaching the summit, I mustered the energy to brave one more flight of rickety stairs to see the bells. 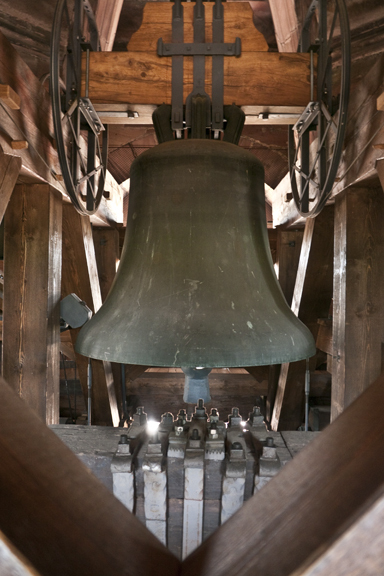 Six weeks later, I’m still wondering how they hoisted the monstrous bells to the top of the spire, wedged them into the tiny belfry, and then maneuvered them onto their brackets — using only pulleys and rope and human strength. Wow. Although I’d pretty much seen everything, my visit seemed a little incomplete because I hadn’t heard the organ. 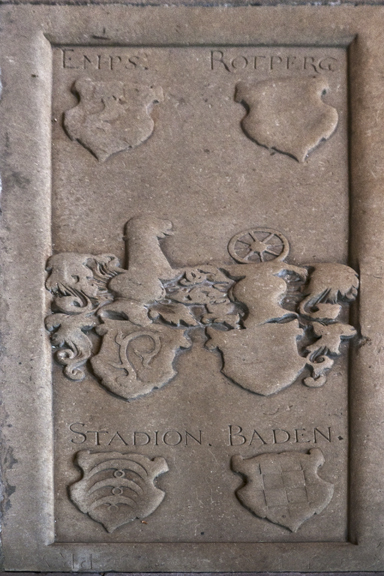 Two days later I got the final installment of my Münster experience, when I happened upon an ordination ceremony for several new priests. 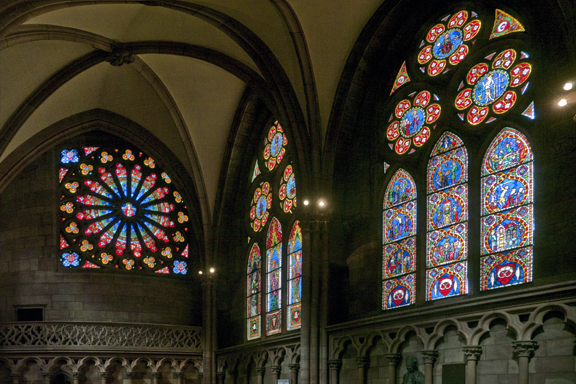 As the people of Freiburg lifted their voices in song, I couldn’t help but reflect on the generations who have gathered here to celebrate, mourn and give thanks. So much has changed over those eight centuries … and yet the human condition remains pretty much the same. We still fight wars, struggle with poverty and fear disease. I wonder if that will still be true in another 800 years. 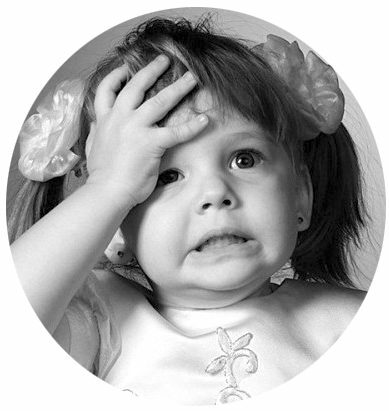 Next Why are Americans so … ? 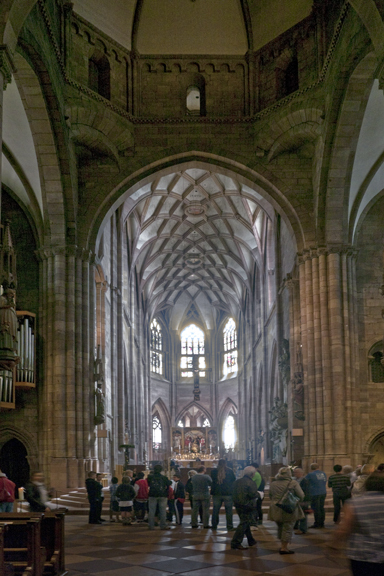 Thanks H, you know I’m a total Gothic church groupie so to see a great German example is pretty exciting & educational. Definitely some notable differences to the French style, in particular the floor plan of having one central bell tower and a nave that extends from it, giving it a very narrow & sleek look. The colors of the darker stones are amazing too, and your shot of the facade w/ the green gargoyles is fantastic. 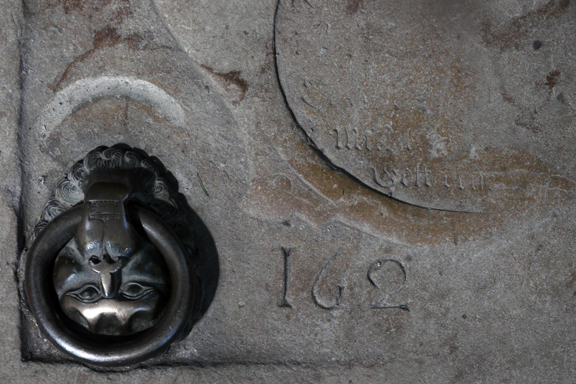 Thanks for an eye-opening look at this monument and the uber-cute village surrounding it. 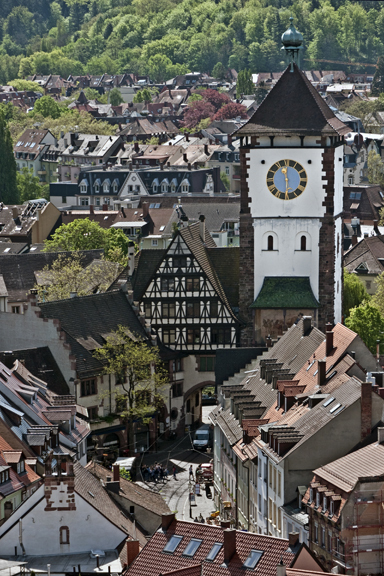 If I ever manage to plan a Germany trip, I’ll definitely try to make Freiburg one of my stops. You’re a Gothic church groupie? Really?! Ha, ha! 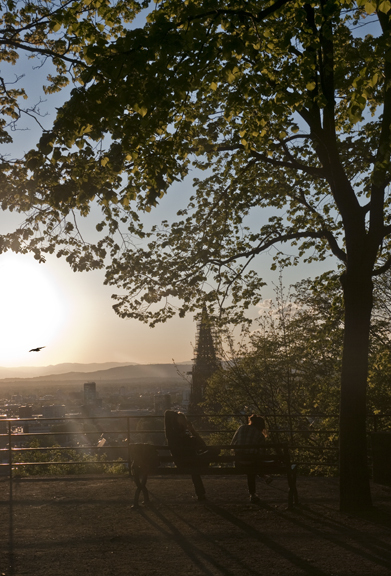 Seriously, I do hope you’re able to visit Freiburg someday. You’d go crazy over the sheer volume of history there. It’s almost overwhelming how much there is to explore and discover. And the really cool thing is that this ancient history is juxtaposed with the young, hip college culture — and in a gorgeous setting, to boot. I’m not usually a small-town kind of a gal, but I’d move there in a heartbeat! 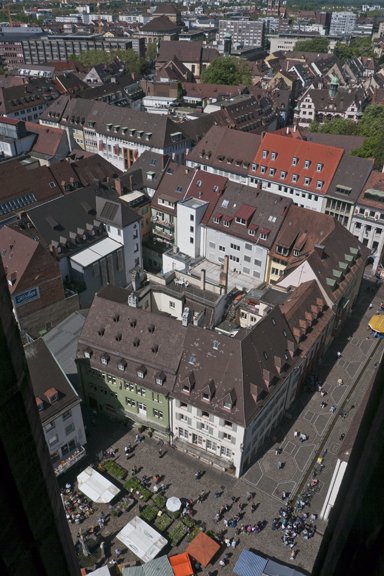 Somewhere around here I have a photo of the Cologne Cathedral (der Koelner Dom) that I stitched together out of nine photos. 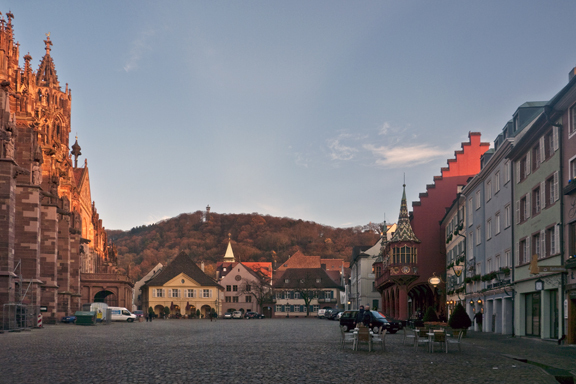 You need a super wide angle lens in a crowded German town to get the big churches in one frame! I’d love to see your 9-frame “photo quilt,” Jim! 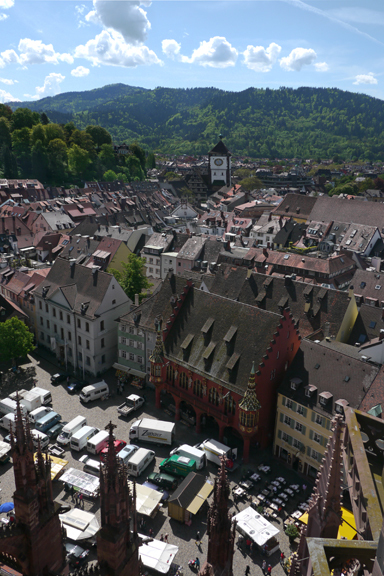 And I’d also love to have a lens wide enough to capture the whole enchilada — though in the case of Freiburg, I think it would need to be a fisheye! 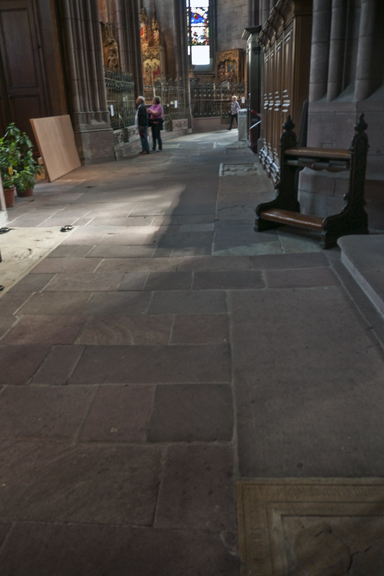 You make such a good point here: a church gives a visitor a really good feel for the history and culture of the town. 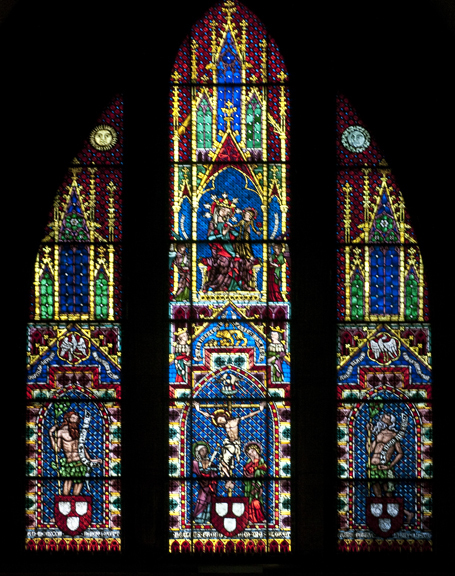 What a thought-provoking post, starting with the appalling inhumanity of war and ending with a meditation on the miracles of medieval building work. 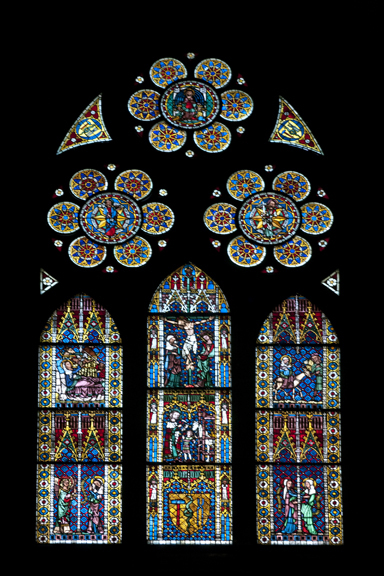 I love the contemplative interior shots here, the transcendent windows (wonderful that they survived!) 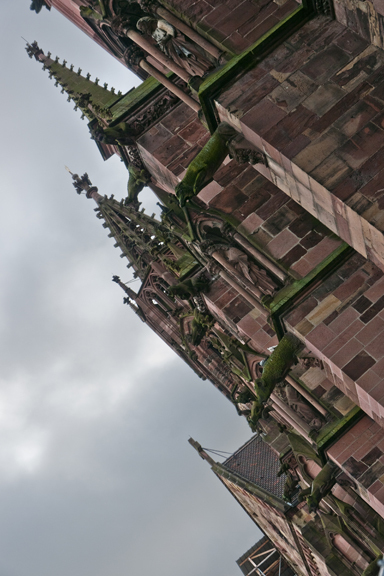 and the green gargoyles. Thanks, H!